We’re very late in the Cycle now and as laid out in the weekend report, my expectation remains that this Daily Cycle will fail. The employment report will be announced this Friday and this always is a market moving event. As the Cycle is due to find its low, I believe this event will be the final driver of the Cycle. This as is an excerpt from themid-week updatet from the The Financial Tap, which is dedicated to helping people learn to grow into successful investors by providing cycle research on multiple markets delivered twice weekly, as well as real time trade alerts to profit from market inefficiencies. They offer a FREE 15-day trial where you’ll receive complete access to the entire site. Coupon code (ZEN) saves you 15%. I spotted your chart and was thinking,”poised to fall into a Doji Close Low, but what is ICL, must be something much longer like a ice tap, a inviting one ? I trade precious metals and count the cycles on various time frames, it looks like on weekly basis theres a b counter trend that could unfold before the final c make that ICL, or just well beyond channel pivot, but then it is maybe not a ICL, are there a specific lenght when classify this candle and at a certain timeframe ? 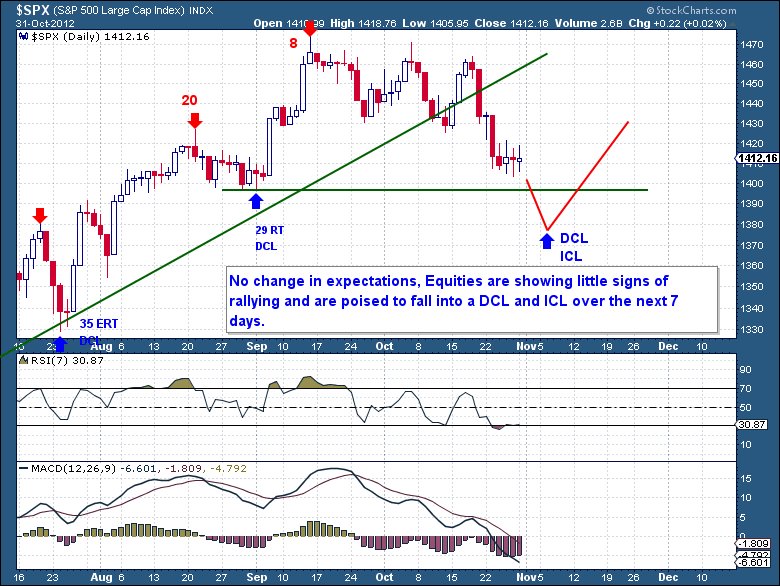 The abbreviations in this report, DCL and ICL, stand for Daily Cycle Low (DCL) and Investor Cycle Low (ICL). These Cycle represent two different length Cycles. The Daily Cycle typically running 22-28 Days from one low to the next. The dominant Cycle, “Investor Cycle”, runs from 20-24 Weeks. The frequency and accuracy of these Cycles is very high and they offer traders and investors a tool that could greatly increase their probability of success. So the chart is illustrating that from the last major Investor Cycle Low (22 Weeks ago on June 1st), we’re now due to form another one of these major market lows. This coming drop below 1,397 should provide us with at least a short term buying opportunity, so traders should be aware of it. I go into much more detail during my weekend reports. If you’re interested, you can signup above on a risk/obligation free trial basis.